​​​​​​​​ SHERMAN – The Sherman Economic Development Corp. (SEDCO) closed a deal that could ultimately bring 150 new jobs to the area and a capital investment of more than $1 billion by 2022. 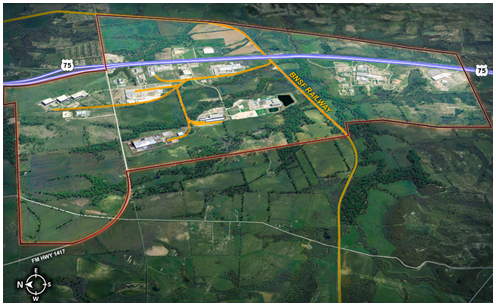 ​​​​The SEDCO board of directors approved a contract with Thea Development LLC to develop the infrastructure for five data centers in Sherman’s Progress Park I.
Cassini Gateway I, as the data center development will be known, will be able to accommodate more than 1 million sf of independently-owned data centers. Thea Development CEO Margie Guido explained the data centers her company is targeting contain computer servers that hold information for the internet. SEDCO officials said the more than $1 billion capital investment expected for Cassini Gateway I would generate 350 construction jobs and over 150 direct engineering, technology and other jobs by 2022. ​​Want more data? See Sherman-Denison Market Overview Research.